Every railroad and trolley line has its logo, CTRC is no exception. 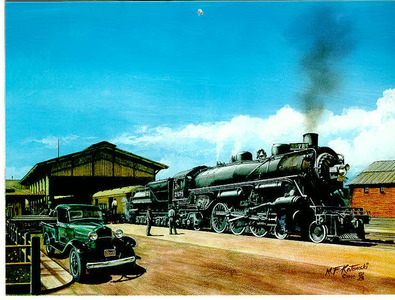 This painting by Michael F. Kotowski shows the SP 2479 at the old San Jose railroad depot with an old Orchard Supply Hardware (OSH) pickup. CTRC is proposing to base the future museum on this scene. 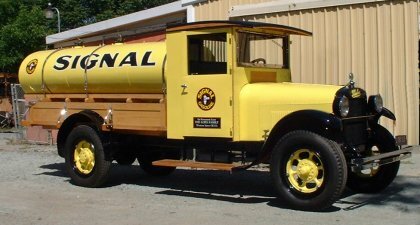 This 1927 Kleiber truck was last owned by the Western States Oil Company of San Jose. 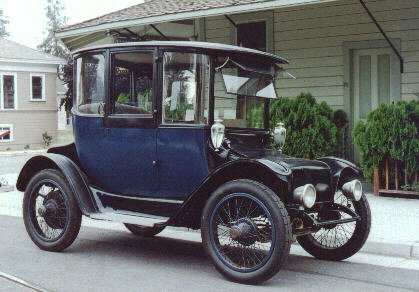 It was used to deliver oil to merchants in the San Jose California area. Little Buttercup being unloaded at History San Jose. 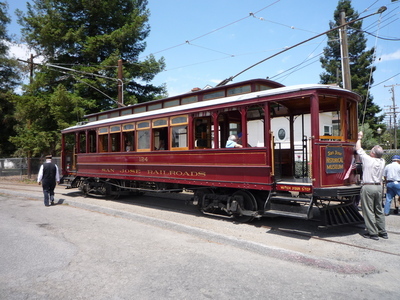 This 1899 vintage locomotive spent time on the San Francisco docks, was at the 1948 Chicago Railway Fair, and spent time at the California Railroad Museum in Sacramento. The move to San Jose was observed by many surprised children. The SP 2479 is a 1923 Baldwin P-10 Pacific that is being restored by CTRC. You can come to the site to see it or help with the work. 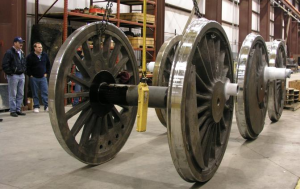 Locomotive driver wheels have steel tires that have to be machined with high accuracy to a shape profile that helps keep the locomotive firmly on the rails at all times. Each wheel must be machined to have the same circumference. There are not many places that have the machine tools to perform this kind of work. The Santa Clara Valley is a natural transportation focus for the San Francisco Bay area. It is one of the oldest railroad centers in the United States. 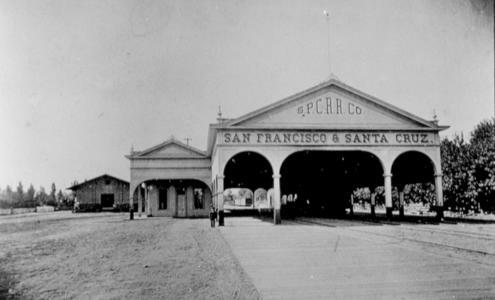 The South Pacific Coast Railroad (SPCRR) was a narrow gauge line that ran between Santa Cruz and Alameda, with Santa Clara in the middle. 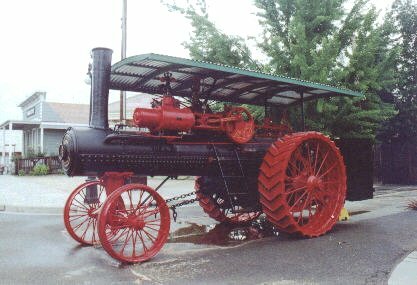 The Port Huron Traction Engine was manufactured by the Port Huron Engine and Thresher Company of Port Huron, Michigan and shipped to Wichita Kansas July 20, 1921. It was used for hauling, plowing and operating machinery from a belt to the engine flywheel. It produced 16 horsepower from a boiler that was designed for 175 pounds of pressure. It took over 10 years of part time work to restore this traction engine. 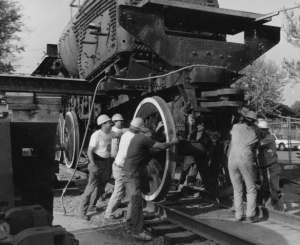 It takes a lot of work to remove the drivers from a large locomotive. The Lenzen Roundhouse used to stand between Coleman and Stockton Avenues in San Jose. The roundhouse the roundhouse and turntable were disassembled and are now stored awaiting eventual reassembly. This car featured dual controls so it could be driven from either the front or rear seat. It is powered by 14 six volt batteries which can be connected as two 42 volt batteries in parallel or as one 84 volt battery depending upon the speed desired. The controller provides for 5 speeds with the top speed approximately 20 miles per hour. The range before the batteries require recharging was advertised as about 70 miles. 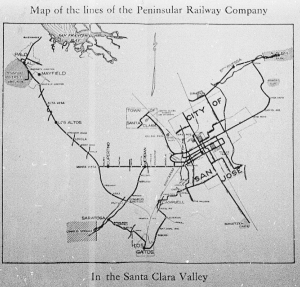 Established in 1982, CTRC, the California Trolley and Railroad Corporation, is a 501(c)(3) non-profit organization with a mission to preserve and reflect the rich legacy of rail transportation in the Santa Clara Valley for the educational and recreational benefit of current and future generations. Rail Museum from WMS media Inc. on Vimeo. 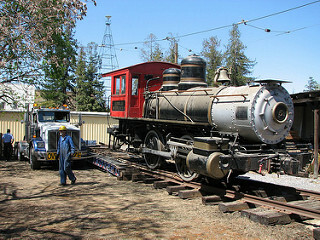 Among the numerous projects underway is the restoration of Southern Pacific steam locomotive 2479. CTRC has restored for operation a number of historic trolley cars. The CTRC Blog contains postings and items of interest, in chronological order. Our search page is available to help you find items of intererst. 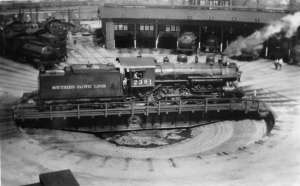 A major undertaking is the creation of the San Jose Steam Railroad Museum with the focal point becoming the former six stall Lenzen Roundhouse and turntable. Membership is open to anyone who is interested - you do not need to be an expert welder or machinist. Please consider making a donation to CTRC. Donate!